Details: Extended roof rafter tails, knee brackets. 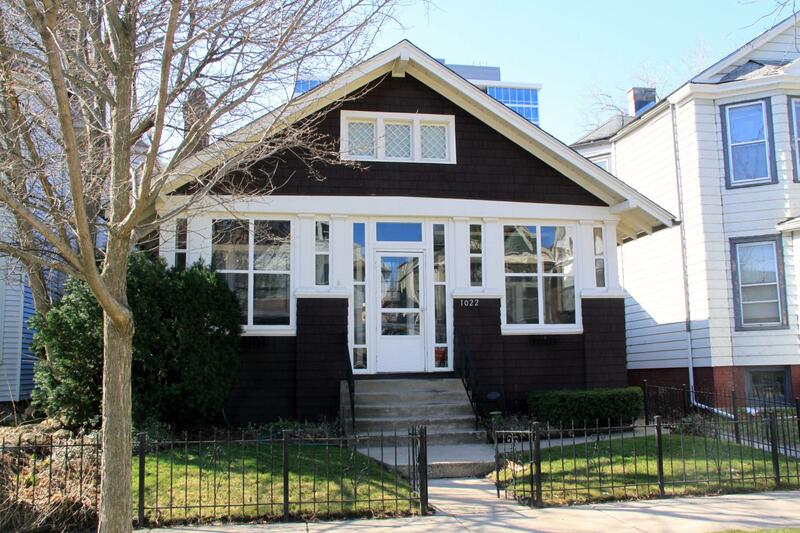 Significance: Constructed in 1910, shingled bungalow with Arts and Crafts influences and is typical of those built throughout the metropolitan Chicago during 1910s and 1920s. Its bracketed gable roof with broad overhangs shelters the structure's glassed-in front porch, which is incorporated into the overall massing of the house. Historic Features: Enclosed porch with pilasters framing window openings; wood diamond- panes windows in upper story; dormer on west elevation; wood shingling; front entranceway with sidelights, rectangular columns across the front porch, separating door and window openings, form a strong geometric pattern across the building's facade. Building Permit Description: 1-sty frame residence; Lot 59; 27'W x 42'L x 24'H; 5 rooms, 1 wc, 1 sink, 1 tub, 1 laundry tub; hot water heat, gas and electric lights. Other Permit Information: 1921.21.09, Permit #9148 for a 1-sty frame gar ($200) at 1022 Ayars Pl., OWN H. Stiles, 1942; Memoranda #22455 notes address listed as 1022 Garnett Pl. 1959.03.11, Permit #34454 for a 1-sty frame 3-car gar ($2200), OWN C. Holmes. 12-Nov.-1999. BP#50286 re-roofing. OWN Bertha Murray. COST $2,410. COA Info: 13PRES-0059: Replace existing wire/chain link fence with wooden fencing; not to exceed 6 ft in ht, E side fence with gate is 22 ft, W side fence with gate is 44 ft. 10PRES-0002: Install wooden railing at exterior basement stairwell. 05HIS0000000127: Tearing off existing roofing material on garage and install new asphalt/fiber glass shingles. Also, remove asphalt siding on garage and install Hardishingle siding (straight edge panel) to match wood cedar shingles on house as close as possible. Paint garage to match color of house. Attic window temporarily removed for AC unit. Historic Info: Source: Evanston History Center Archives (3-ring binder) STATEMENT OF SIGNIFICANCE: A7 Constructed in 1910, the shingled bungalow was conceived in the finest Arts and Crafts tradition and is typical of those built throughout the metropolitan Chicago area in the Teens and Twenties. Its bracketed gable roof with broad overhangs shelters the structure's glassed-in front porch, which is incorporated into the overall massing of the house. Rectangular columns across the front porch, separating door and window openings, form a strong geometric pattern across the building's facade.